In the wine business, like in almost every business, location matters. Wineries spend a good deal of time thinking about where to hang their sign to make sure that they draw enough visitors to sustain the business. They also often spend a good deal of money for the right real estate. And with good reason. A proper location can be the difference between success and failure. What to do then when your winery location suddenly changes? On Monday June 21, a new section of Highway 12 opened on the way in to Walla Walla. The new section is part of a multi-phase project funded by a variety of agencies and municipalities (see the complete list here). The goal of the project is to improve safety and increase commerce by widening U.S. Highway 12 to four lanes from the Snake River Bridge (US 12/SR 124 intersection) to the city of Walla Walla (see a list of project goals and progress here). Long-timers such as L’Ecole No. 41 and Woodward Canyon have long benefited from drive-by visitors arriving into town. More recently a number of other wineries have also opened up facilities on or off Highway 12 west of Walla Walla. These wineries include Bunchgrass, Reininger, Three Rivers, Skylite Cellars, Glencorrie, Long Shadows, Cougar Crest, and Waterbrook. The Highway 12 location, the main driving route from Seattle to Walla Walla, seemed perfect for attracting tourists and selling wine. Until the highway moved. Since the most recent highway changes were completed late last month, the affected wineries - principally Skylite Cellars, Bunchgrass, Cougar Crest, Glencorrie, and Three Rivers - have been working to grapple with the changes. Wineries that were once right on the highway are now off the highway and out of the way. Worse, there is at present no signage. 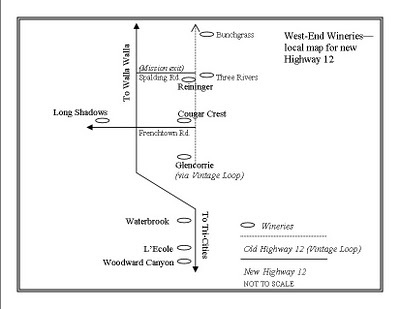 To compensate for the changes, the wineries plan to put signs on feeder roads and intersections of the old highway. 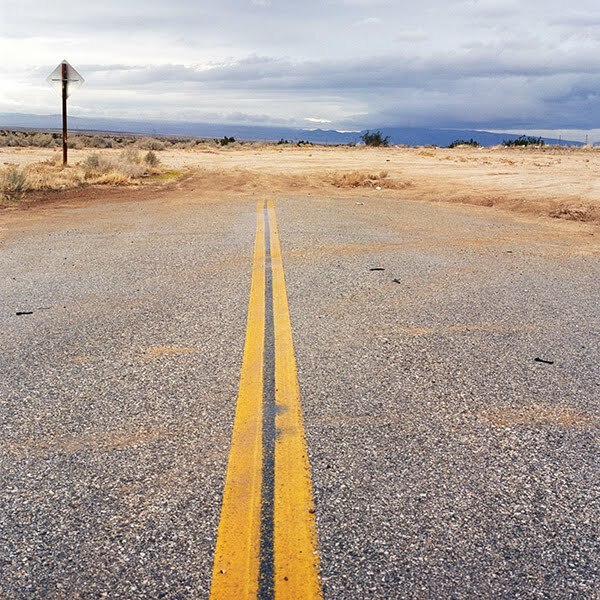 However, there are apparently sign restrictions on the new highway itself as it is designated as a scenic highway. The west side or ‘Vintage Loop’ wineries met last Tuesday to discuss the effects and how to deal with them. Larger, established wineries have seen a visitor drop-off of as much as thirty percent with some smaller wineries seeing a drop-off of sixty percent or more. Tom Olander at Bunchgrass Winery is a bit more sanguine. “It is a bit early to gauge the full impact of the changes,” he says. “Once all the changes are made, and all the signage has been installed, we think this will be a very positive change for us. Visitors will be able to slow down and find our driveway. It will be safer to exit at all points.” Similarly, Kelly Tucker at Reininger Winery hopes that the changes will make it easier for people to get to Walla Walla and that they will come more frequently. Whatever the long-term effects, the completion of the project in the midst of a recession and during the tourist season is sure to present some significant challenges for these wineries in the short-term. Stay tuned. Photograph courtesy of Whitney Dafoe. Graphic from Woodward Canyon Winery's blog. I hope people will see this and make arrangements to visit our wonderful neighbors regardless of the road construction. They won't be sorry for their troubles! I didn't know the road had changed. I wasted nearly an hour trying to figure out where a winery I had been to in the past had "moved." There is enough rolling wheat fields that the wineries who have invested in their tasting rooms should have ab exception for prominent signage. WC, you are quite welcome. Hoping as well that the old Highway 12 opens up soon to at least make some of the problems better. Anon, you are one of many I believe that was thrown pretty hard off course by the changes. For me, it was very surreal arriving in to town and looking for the wineries one always passes by. Thanks for the comment. 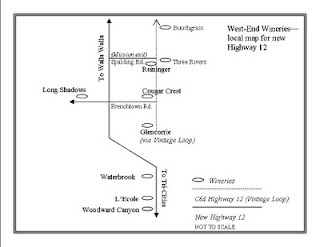 Thanks for the great article on the Old Hwy 12/West end wineries, Sean. We're really making some big adjustments and hoping it will all pay off. I wish the DOT had let us have our signs up and visible for all to see before opening the new hwy and also had hoped that they wouldn't have blocked us off for 3 weeks the way they did when they were creating the Old Hwy-New Hwy merger up by Waterbrook. Oh well... We'll keep rolling and will hopefully survive this adjustment. Good news is that we're now in the 2011 Walla Walla Wine Alliance Map. Also, we're working together with the other 10 west end wineries to create 3 directional signs at all the exits - Sudbury, Spalding and Frenchtown.These signs, along with the DOT signs up above, will help drivers get around out here. The west end wineries map that Marlene @ Woodward Canyon created has also been very helpful in handing out at the bar - "You guys really need to visit these other fantastic west end wineries, etc., etc." Thanks again for the mention of us out here on the west end.